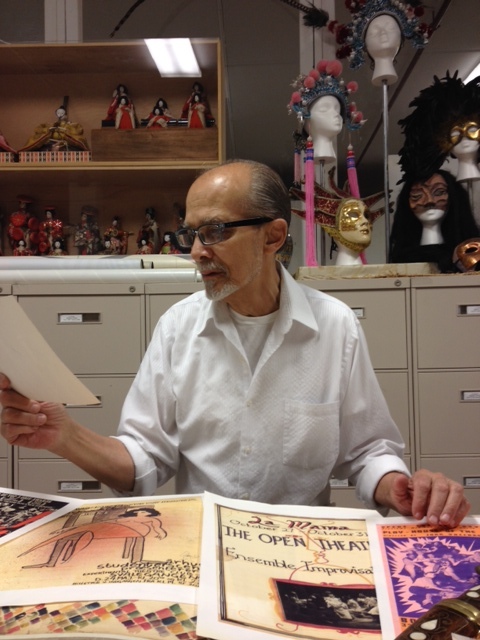 Ozzie Rodriguez (Director of the Archives + Resident Director) has been the Director of the La Mama Archive since 1987. A bilingual playwright and actor, he is Founder and Artistic Director of two experimental theatre companies and the author of several plays (including Madre Del Sol / Mother Of The Sun, for which he received the Distinguished Contributions to Hispanic Culture Award). He has been Resident Director of Ellen Stewart’s La Mama Experimental Theater since the early 1970’s and has toured throughout the world as a member of the Great Jones Repertory and La Mama’s Umbria Company. Artist) is a performer and director with a long history of involvement at La MaMa. In addition to being one of La MaMa’s Resident Artists, she is a Senior Artist with Pan Asian Repertory Theatre and a member of Yara Arts Group and the Great Jones Repertory Company. Sophie Glidden-Lyon (Project Manager) is a historian and archivist. She holds an MA in Archives and Public History from New York University, and has worked at the Maine Women Writers Collection, the Fales Library and Special Collections, and for the New York City Municipal Archives. She has a background in art archives and artists papers. Kate Philipson (NHPRC-funded Project Intern) is a current student in the Archives and Public History MA program at New York University, where she also works in the MediaPreservation Unit of Bobst Library’s Barbara Goldsmith Preservation & Conservation Department. At La MaMa, Kate is working to enhance description and expand access to the Archives’ collection of productions recorded on half-inch open reel tapes from the 1970s. Tiffany Nixon (Project Consultant) has been the archivist for Roundabout Theatre Company since 2008. She holds an MLIS (Archives Concentration) and an MA (English Literature) and is an active Board Member of the Theatre Library Association and the Performing Arts Roundtable of the Society of American Archivists. Rachel Mattson (Project Manager, 2014 – 2018) is a historian, educator, artist, and archivist. She holds a PhD in US history from New York University and an MSLIS from the University of Illinois at Urbana-Champaign. She is a core member of the XFR Collective and the lead organizer of the Digital Library Federation’s Government Record and Accountability Interest Group. She has performed as a giant puppet manipulator with the Aftselokhes Spectacle Committee and Great Small Works, and served, for many years, on the board of Circus Amok. She is now the curator of the Tretter Collection in GLBT Studies at the University of Minnesota. Alice Griffin (Metadata/Digitization Assistant) is a current student at the Pratt Institute School of Information. She is generally interested in archives and special collections, and has been thinking a lot about how cataloging and metadata are their own sort of art form. At La MaMa, Alice cataloged and digitized hundreds of show files, enriching our digital collections. Louisa Lebwohl (NHPRC-funded Project Intern) is currently completing her masters’ in library science through Syracuse University’s online program. At La MaMa, she worked on the grant-funded project expanding access to the Archives’ collection of half-inch open reel tapes from the 1970s. Her background includes work in public libraries, archives, and historical societies. She is now a children’s librarian at the Queens Library. Jameson Creager (Cataloger, November 2015-March 2016) is a recent graduate of Princeton University where he studied East Asian Studies and worked at the Department of Rare Books and Special Collections. Pooja Desai (Intern, Fall 2015) served as an Intern at La MaMa while pursuing a Masters degree in Archives/Public History at New York University. At La MaMa, Pooja createda digital exhibit that explores queer theatre in La MaMa’s early years. Michael Grant (Cataloger, 2016-2018) is a graduate of the Moving Image Archiving and Preservation Masters program at New York University. He has been member of XFR Collective and an archivist at NYU Libraries, where he worked to reformat and preserve critically out of print VHS and audiocassette titles. He also works in a supporting capacity with his wife, musical theater writer Kit Goldstein Grant, on her many projects and productions. He left La MaMa in the Winter of 2018 to join The Standby Program as a Magnetic Media Preservationist. He is now also a member of the team at the NYU Media Preservation Lab. Suzanne Lipkin (Cataloger, May 2014-October 2015) is a recent graduate of the School of Information and Library Science at Pratt Institute. She left La MaMa in October 2015 for a full-time job the New York Public Library for the Performing Arts, Billy Rose Theatre Division. Caroline Roll (Intern, Fall 2015) served as an Intern at La MaMa during while she was pursuing a Masters degree in the Moving Image Archiving and Preservation Program at NYU. At the La MaMa Archives, Caroline worked with the 16mm film collection. Julie Sandy (Cataloger, May 2014-August 2015) is librarian, prop master, Broadway stagehand, seamstress and home renovator. She left La MaMa to take a position in the Roundabout Theatre Archives. Deborah Shapiro (Intern, 2015-2016) is a professional archivist, a non-professional linguist and a decidedly amateur violinist from Brooklyn. She served as an Intern at La MaMa while pursuing a Masters degree in Archives/Public History at New York University. She now works in as a reference archivist at the Smithsonian Institution Archives.